Uploading Pictures To Blogs. ~ The Blog Doctor. You are here: Home > Picture > Uploading Pictures To Blogs. At the outset let me reiterate that you can only upload pictures to blogger and for all other files see Upload files to Blogger. Click on picture (Image 1) to enlarge it. The above code is for the Image 1 in this post. To reposition the image within the post select this whole code and cut and paste it to wherever you want in the post. You can also do this by clicking on Compose tab of Post Editor and using drag and drop. NOTICE again that the above picture cannot be clicked to produce a bigger image like Image 1 above. NOTICE that the first link is the link to the unaltered image. Replace the caps with the link to your picture in the free host. Add width and height parameters to the code to speedup the loading of the page. 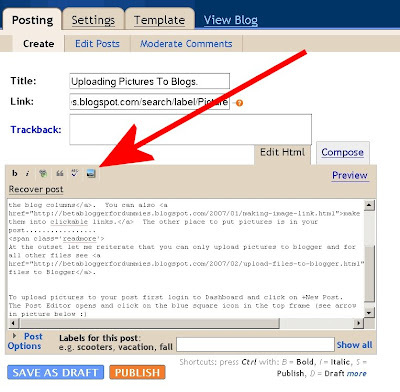 To put a picture in your profile use the second method by uploading to a freehost as it is easy to make a mistake while extracting image links from uploaded images in Blogger posts. Then login to Dashboard and click Edit Profile link in sidebar. Scroll down and paste your image link in Photo URL box and save. 100 VIEWERS CLICKED HERE TO COMMENT ON THIS POST. ADD YOUR COMMENT. Is there a way to post the image without blogger resizing it? For example, if I want to post an image that is 600px wide, is there a way to do that? May i know how to display the picture side by side? When i upload more than 1 picture, it will automatically display in column. I have tried to manually adjust it but fail. Your page is great. It helps me a lot, spceally when I was trying to put a picture in the header. but I have a question: do you have any idea how we upload pictures in the posts and then when you click in the picture, the picture will open in a type of pop-up window, where you could navigate trought the photos easily, going foward and backwards in the pictures. For my profile picture, the image link disappears from my Photo URL field after clicking Save. What could be causing that? I know the link works, because I've opened it from a new browser. I've refreshed the cache and tried it with Firefox, but the image link still disappears when I click Save. Is there anything else I can do, or should I report a bug? I've imported images into my blog without problem, it's the profile image that isn't working. Thanks. Try uploading to Googlepages. Use my email address in left column for more detailed help. That's fantastic! It works with Google pages. Thanks for your help and patience! Your blog is terrific. I'm so glad I found it. Can you tell me how I can get my animations moving again. Some of them work and all of a sudden some of them stopped a few days ago. I'm using only 1% of my space and have 15 posts on my main page. Thank you. Animations sometimes stop and start of their own accord. If you can be more specific about what you want to do we may be able to help you. Use my email address in the middle column to send me email. I'm new to blogging and want to put simple captions under my photos within the text of each post. Is there a simple way to do this for the novice? Thanks! I don't want my images to be enlarged and I don't want the link to the enlargement image. How do i do that? Replace the CAPS with your image link and publish the post. The image will not be enlarged and will not link to another enlarged image. Thanks for your quick reply. But I do see some of my friends' blogger images "unclickable". And I am pretty sure she didn't host the image somewhere else. Does blogger allow that function? Or can I tweed the html code or something? As explained in the post above it is easy to make a mistake while extracting the image links from the whole code which blogger writes after the upload. There are two image links in the code : One of the original image and the link of the resized image. See the post above for how to extract the link after uploading and then paste it in the same code given in my previous comment. When creating new posts, blogger no longer automatically creates links for my pictures (I am using the upload picture button). As a result, readers can no longer click on the photo to enlarge it. Any idea what is going on? I have searched through my settings but can't find this "feature" anywhere. Have a look at the picture code, in Edit Html tab, after uploading it. If it is similar to the one described above then you need not worry. I forgot to mention in my original comment that yes, the html for the picture link is in fact missing. I will try your two suggestions--my team member publishes on the same blog using Firefox and does not have this issue. Thanks so much! Very educational your post. Thank you. I did not see you comment on uploading to the template. After I upload one picture, when I try again get a message that says something like "correct errors on the form", but I do not see anything to correct. That prevents me from uploading for that entire day, but if I try again some days later then I am OK ONE TIME again. You have to combine multiple photos into a single photo on your PC and then only you can upload it. At the moment Blogger does not offer collage making services. Use Firefox browser. Try another browser like Opera. Love your blog it has helped me post a photo onto my blog:) I am having a hard time posting another photo on the same blog page. Where do you get the error message and what is it? I didn't get an error message what happens is the upload page with the exclamation point saying the upload takes places stays up forever. When I uploaded the first picture with the help of your awesome blog it was very quick. Can you post more than one picture on the page? Thanks, Vin! Once again, you take the time to point out the obvious to us too blind to see it staring us in the face. First time I put pictures in a post and they look great! I have uploaded an image and it looks fine in preview mode but after publishing it turns into black and white. It's like that in any place on the blog - posts, heading, side banners. I suspect that it has something to do with template because I am using customized one but I can't figure out where is a problem. Any ideas? Thanks for any help. What is your blog address and where is the image? Hi, how do I resize my images without pixelizing it? Whenever I resize they end up pixelized. Also, how do I take the borders off my pics? I have this thin border around all my pics. Thanks! sometimes when i add an image, it screws with the text in the post. the spacing is all wrong, rendering it nearly unreadable. help! Hi Vin, it's great I have found you!!!! Then paste the code in Edit Html tab of Post editor. Publish Post. I am on the same way of other readers and need to thank you about nice job here... Would like to close with a question. I am doing my initial "transmissions" with Word 2007 and works fine with text. I made a test with one picture from my own HardDrive and send the post to Blogger. Only text appears... Can I upload images directly from my HD, and together the respective text, using MS Word? Show Word Docs. in your posts. Not sure what you mean...I am trying to enlarge the profile photo on the homepage of my blog. Is there a setting somewhere within blogger that I could adjust the size? LOL! No need to print out the whole page! Just copy and paste what you need to a Notepad file and print that. All this info is great. I'm on an initial wade-through---just learning. Good explanations, but it fails to tell us how to post photos with wrap-around text. THAT would be incredibly helpful info! Have a look at Tips on Pictures in Blogger. for me the second code does not work, its not any bigger..
Have a look at how to Upload Pictures Without Changing their Size in Blogger. Hi there, I've been doing my blog for about a year or so. I've had no trouble uploading photo's till now. After uploading I click done but all that shows up in my post is a whole lot of code stuff I don't understand! Why and how do I fix it so the actual photo shows up? Hi again, I forgot to mention that I have already resized the photo's on my photo programme on my pc. Click the Compose tab in upper right corner of Post Editor to see the picture. If you mean the first image in the right sidebar then it is too big. There is no space for additional margin. Either upload a smaller sized image OR increase sidebar width. i had a recent problem with uploading d pics on my site. i tried two or three times but the same problem i've got it. other entries were totally disappeared on my site..
Could u plz tell me how can i get all my old entries n new one. thx vin ..im waiting for ur reply. Try using Windows Live Writer. I want my photos to be larger when I upload by default. instead of 400px being the max width or height, I would like a 600px. Can I change this in the code permanently? This site is cool and very helpful, i needed to look No further when i came here! Thank You for making things a lil' easier! Hi Vin, I have a specific problem about uploading photos on my blog. I basically follow the usual uploading procedure (I always have) but it doesn't work. I don't even get an error message after it supposedly finishes uploading them. The images just don't show up on the post. I have been trying to upload several different sizes, number of images at a time etc and it goes to the 'DONE' page but then nothing appears on the edit post page or on the html. And I know I have plenty of space for them in my blog and the images are too small to not upload because of size limitations. I was also able to upload and change the profile and title images but just not add images to the posts. Could you please point me in the right direction as to how to fix this? Check the Picasawebalbum for your blog if the images have uploaded correctly. You can also use the free WLW Post editor to upload images. prob ive got is that when i post pics they r in blck and white when posted but when u clcik the pic thats posted it opens up in colour also with side bar pics. Pictures cannot be seen in comments. They can send you the pictures and you can upload them to posts and put their comments under them. Alternatively you will have to make them Blog Authors (Settings---->Permissions) so that they can do it themselves. I have a common problem but can't find an answer: When I upload photos to my blog, some of them are coming out rotated 90 degrees. I have tried saving them in Paint, and I have tried uploading them sideways, but it doesn't work. Can you help? I have a common problem but can't find a solution: When I upload some photos to my blog, they come out rotated at a 90 degree angle. I have tried saving the image in Paint, and I have tried rotating it in an image program, but it still comes out wrong. Can you help? Thanks for the good works you guys are doing. More grace. I was trying to upload picture from my system to my blog but it was telling me :"There were errors during upload.This image could not be uploaded due to an internal error." The picture was originally downloaded to my system from flickr. Try the more user friendly free Windows Live Writer Post Editor. I'd like to make it so that when I post pictures on my blog you can't see my background image through them...How do I do this? I have tried several times but it gave thesame information. Check out the Windows Live Writer Help and/or support forums. when i post pictures side by side, if i select the pictures to be medium or large, the picture on the right is half way cut off...help! what am i doing wrong? only the small size photos work. when i post pictures side by side, the picture on the left is cut half way off when i select medium size or large...it won't cut them off when i select small. i would like to have bigger pictures side by side...can you help me? Depending on your picture size you may have to increase blog width.Use the free WLW post editor to easily create tables and post pictures side by side. Hello, I have made some changes in my blog template to make it wider that I learned from this webpage. When I do this however I do not manage to make the photos I have uploaded to change together with the new width. Do anyone know how to do that? Easily? Try changing the numbers in the code for the uploaded images. Easier would be to resize and reupload them. Try the free Windows Live Writer to post images to Blogger. i am unable to see those images in my html page, but i am able to see if i copy the source code n paste the same in a browser..